Ever since I can remember, I have always been rebellious and a person that insists in every facet of my life that I march to my own beat. Where people (from family to members of society) have stood in my way, I have been willing to vigorously challenge those persons, the status quo, and structures, until all knew to fall back and let me be me. I have never seen others, no matter how amazing they are, successful, good looking, wealthy etc. as my competition. I am my own competition. However, being my own competition and marching to my own beat does come with a price. It means I am constantly seeking to break my prior records, and that when I have failed (by the personal standards I have set for myself on what I think success is), I have been particularly very hard on myself. Failure is a hard thing. It makes you question everything. Almost every assumption you have ever had, including your abilities. It can sometimes make you feel ashamed, isolated, and yes even scared. Who likes failing? No one. However, what I have learned about failure is that it is a great reminder that we are all on this journey called life, and it is the journey itself that creates the strength we need to succeed. 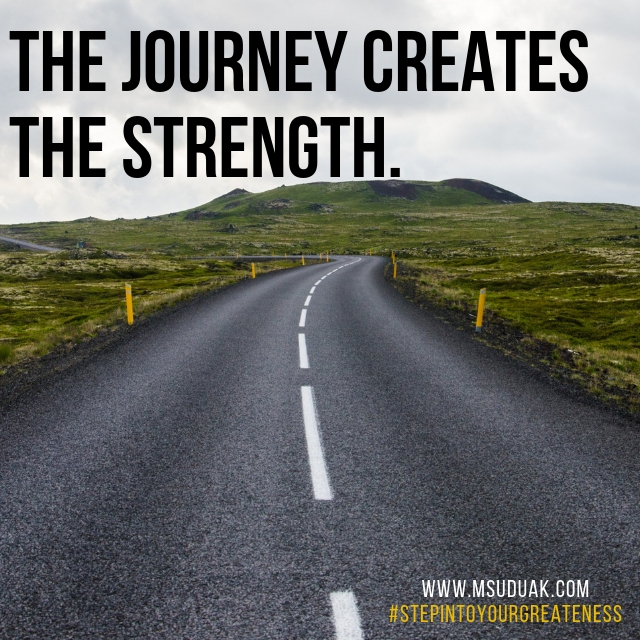 It is the journey, not the final destination, that helps you with character building, resilience, mental strength, compassion, empathy for others, and so much more. So, if you have failed (whether it is a failure in your relationship, career, business, family, or the personal standards you set for yourself), embrace the failure. Do not let the failure define you, beat you around in your head like a ping pong, or force you to take on a new identity based solely on the failure. Instead, wrap yourself around that failure until you understand the lessons it is trying to teach you. Silence all the noise around you, get still. Listen. Get away if you must to a place of serenity (I personally love the beach) and get clarity. Do all that, cry if you must and then get up and start rebuilding yourself for success, one day at a time because truly, it is the journey of failure and the lessons learned that will create the strength and triple fire you need to smash past records and be in your own Guinness Book of World Records.